I generally hate the hyper-patriotic memorialization of this day, as I’d prefer to forget. But today saw many on social media sharing their stories, so I thought I’d share mine, too. I was in the subway, headed to work at the Civilian Complaint Review Board a couple blocks south of the towers, in the financial district. The train stopped, as it often did for track work or obstructions. But it stayed in the same place. We didn’t get out for what seemed like forever: the car filled with smoke and dust as (I now know) the towers collapsed. We were finally released onto the subway tracks, and guided back to a platform. When I emerged, I headed to work (closed, obviously) and then walked towards the collapsed towers until I couldn’t breath, not really comprehending what had happened. I needed to get to Harlem, but the way north was blocked. The sky was black, and everything was covered in ashes, including me. The streets were full of expensive women’s shoes, discarded as they ran. I took brief refuge in an office building, borrowed a phone, and called my partner. Then, I joined the other survivors trudging home: the subways were working, slowly, above Union Square, so I stopped at the Target there, drank some water and got on a train. I arrived home sometime in the late afternoon, and then I slept. The truth is that I was pretty lucky: our train wasn’t right under the towers when they collapsed, so we were just inconvenienced (and scared.) One guy from my office died: Hernando Salas. I try to think about him, today, and also to take Judith Butler’s advice not to obsess on narratives that start Tuesday morning, but instead to think about the stories that go back decades that led us all there. I always have trouble expressing my feelings on 9/11. Finally, someone has done it for me. Of course the World Trade Center attacks are a uniquely tragic event, and it is vital that we never lose sight of the human tragedy involved. But we must also not lose sight of the fact that I am right on every significant moral and political issue, and everybody ought to agree with me. Please, I ask you as fellow human beings, vote for the political party which I support, and ask your legislators to support policies endorsed by me, as a matter of urgency. Allegedly, this was written on 9/12/01, but I’m dubious anyone could be so incisive and witty so quickly. Perhaps that’s just because I’m not particularly incisive or witty. I’ve been having an ongoing conversation with a number of people about the supposed ‘plight’ of the well-educated white male. We’ve been searching for the non-existential root causes to the alienation that many left-leaning white men experience in US culture, especially the academy. The idea is that, while we are all human and troubled by our impending deaths in some fashion, our context has made that mortality feel different to white men than, perhaps, to anyone else. I find the discussion endlessly fascinating, probably because of my milky epidermis and my penchant for pants. But in light of the claim that social justice-types somehow fail to take up the perspective of the victim, I think we begin to hit on that element shared by white men of all political stripes. It’s this: we are completely incapable of victimhood. What I mean is this: we don’t know how to be victims. We’re not even sure what it looks like, except when we see it happen to someone else. I worked two blocks from the World Trade Center, I’ve had my car radio stolen, I’ve been punched in the face by a number of strangers, and I’ve never felt like a victim. It’s not Stockholm syndrome, exactly, although that’s the card that conservatives play. It’s not that we side with the terrorists or the criminals: pasty boys like myself are more than happy to spit in the eye of the thief, trade jabs, and cry at the atrocities committed against our friends and colleagues. We’re not siding with the bad guys when we ask questions about causes and effects, or use our loss as an excuse to buy a really nice new stereo. It’s just that we’re imaginatively-impaired: we simply can’t imagine that the experiences we’ve undergone are truly victimizing. Poverty, brutality, disease: when they happen to other people, they’re the effect of social and economic conditions, tragic and unfair and inexcusably our fault. When they happen to us, they’re still our own fault, the combination of failed ingenuity and lack of manly action. Why didn’t I park closer to a doorman? Why did I support a government with such stupidly cruel mid-East policies? Why didn’t I punch him first? From this recognition, there are a number of different judgments available to white men and the theorists of race and gender. Many identify this sense of agency as an enviable characteristic that, like other social goods, should be shared more equitably throughout the population. They prescribe the arrogant presumption of us pale-skinned poppas to all the non-white, non-masculine, non-affluent, non-hetero victims. A world full of people who don’t experience victimhood, they argue, is a world without victims. Those with the mentality of victimhood are thus to blame for their lack of agency, which is a particularly disturbing account of the problem of politics, and one that I often associate with Hannah Arendt, who I otherwise respect. The fault is not in our stars, this line of reasoning goes, but in our selves. The other possibility is to take very seriously a structural notion of the constitution of subjectivity, such that action and passion, agents and victims, require each other, and support each other. On this model, in-groups require an Other in order to sustain their own solidarity, and cream-colored cocksmen need someone to dominate and victimize in order to realize their own potency. The family unit becomes a microcosm of power and passivity, and produces both strength and weakness. As such, the world is constructed from these interlinked pairs: the heteronormative couple, the parent-child relation, bosses and their subordinates. These have macroscopic effects as well, based in larger social concatenations: the imperial hegemon and its provincial periphery, the developed and underdeveloped world, or the Global North and South. If anything, the so-called ‘plight’ I described is simply a refusal of these relations without a coinciding sacrifice of the subject position of invulnerability. Neither stoically self-mastered, nor accepting of one’s lot in the global hierarchy, today’s bougeoius Caucasian male is caught between rejecting the racial/sexual contract and giving up the spoils of racist patriarchy completely. It’s a tough situation, if you’re moved by the tragic flaws of our Oedipal heroes (and probably you aren’t). But since it’s my blog, and “my” problem, I’ll continue to work on it. The solution may lie in the one possibility I ignored: what happens when dudes like me come to understand our own position as something for which we are not responsible? What happens when we take ourselves as victims, as passively undergoing the imprint of social and cultural forces beyond our control? When we take it as given that we are not the agents of our destiny, but rather the product of the work and efforts of others? To understand the victimhood suffered even by the top dog in a hierarchical society, we would have to sacrifice just that invulnerability that seemed most central to the masculine identity. In its place, however, it seems as if we might gain a responsiveness, a passivity on the other side of quiescent inertia that acts not of its own will, but at the nexus of social forces and as the plurality of calls of conscience. What that means for the impassive non-victim is that we can imagine a type of subjectivity that is neither dominating nor submissive. It would replace the mythical invulnerability with which I began with something a bit more reasonable: a vulnerability which is neither frail nor weak. No longer committing gravitational absurdities like ‘lifting ourselves up by our bootstraps,’ we would have to acknowledge those who help us up, and what sorts of duties those helping hands engaged for us. I should like to think that this newly vulnerable character would still be animated, moved and moving, a vital part of the exchange of goods and ideas. Nor is it a matter of ceding the spotlight to women and minories, but of widening the spotlight until being enlightened ceases to be special. But the key to this vulnerable virility is to fundamentally alter our views of acting and undergoing: we have to change the way it feels to be ourselves, to perform our identities and undergo out educations. It’s a phenomenological project, a matter of reforming the horizons of our worldliness. Sadly, I’m concluding on something of an abstract note. But this third-way masculinity has always struck me as importantly inspirational, a principle waiting to be put into practice. Like most novel ideas, it is not my own: I’m actually cribbing from a half-dozen of Jacques Derrida’s essays, and especially his book Aporias. Derrida himself is hardly an originator: his most important works were always readings, deconstructions, of the work of others. But if the idea is right, that imprint undergoes alterations to fit, and its transmission is never an exact repetition. It bears his patronym, but also my own signiature. 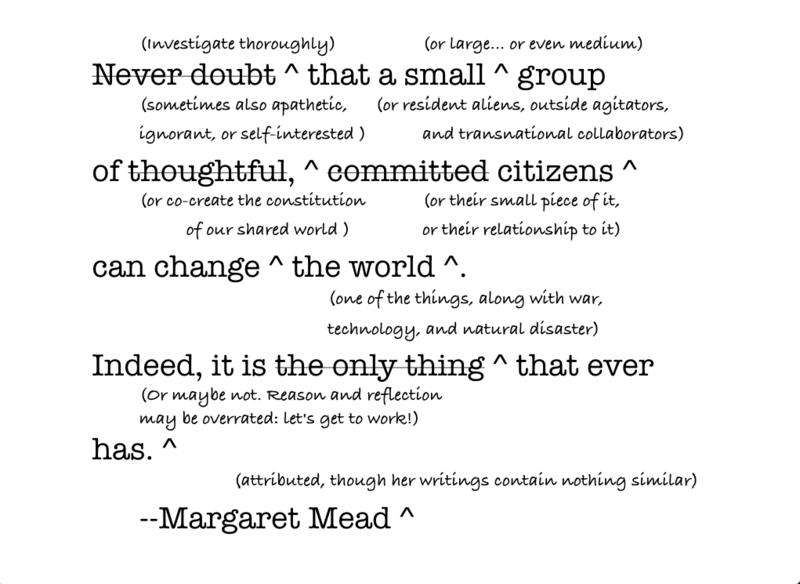 The more of us who take up this style, write these ideas in our own voice and in our hand, the better off we’ll all be.